Gracefully Gone, written by actress, author, Alicia Coppola is a merging of two journals. One of Alicia’s father as he journals his 10 year journey after being diagnosed with cancer. The second from Alicia’s eyes as she begins her journaling as a 12 year old girl who’s father has cancer. Alicia was that “1 of 3” in college during her father’s end-of-life and she was 22 when he lost his battle and died. Gracefully Gone is honestly written and is a must read for anyone grieving from a loved one’s death or the diagnosis of a loved one’s terminal illness. 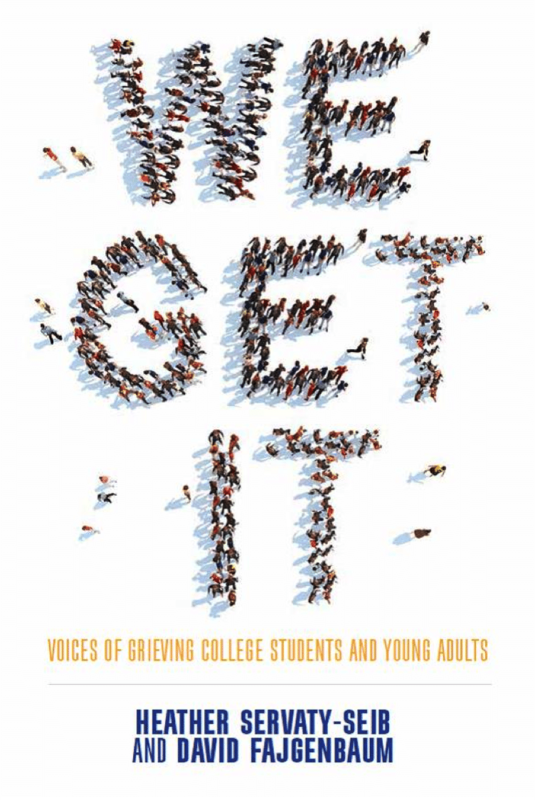 We Get It is a unique collection of 33 narratives by bereaved students and young adults. This book aims to help young adults who are grieving and provide guidance for those who seek to support them. From developing a sense of identity to adjusting to life on and off campus, when it comes to grieving the death of a loved one, college students and young adults face a unique set of issues. The narratives included in this book are honest, engaging and heartfelt, and they help other students and young people know that there are others who “get” what they are going through. Dear Martha, WTF? Tricia LaVoice’s life turned upside-down when her parents were tragically killed in an automobile accident. Her close relationships with her mother and father made everyday life afterwards a challenge. Says Who? If there is an overriding philosophy that Ora Nadrich ascribes to, it is this: you can help yourself solve your own problems, you can do it daily, and the process doesn’t need to be complex. Flying in the face of the often oblique language of the self help movement, Ora, a Mindfulness Coach with a thriving practice in Los Angeles, prides herself on not only having devised a method of self discovery and mindful practice that is simple, direct and applicable to everyone, but is also easy to understand and put to use. And, like brushing your teeth, can be done daily and take about as much time. Simplicity is her mantra. That philosophy forms the basis of Says Who? 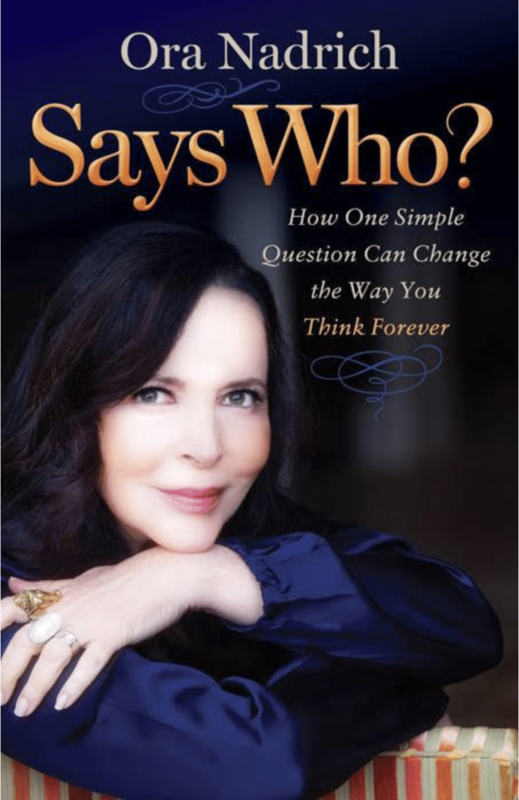 How One Simple Question Can Change the Way You Think Forever, in which Ora vividly illustrates and breaks down her simple yet highly effective method, based on the principle that while we all face obstacles and negative thoughts in our lives, it is not enough to simply examine and be aware of them—we must question and challenge them in order to bring about true change. Many of the obstacles people face, are the result of their own negative thoughts holding them back. And often those thoughts don’t even originate within them; they’re the ideas or opinions of someone else—a critical parent or angry spouse, for instance—which they believe without questioning to see if they’re even real or true. Since thoughts create beliefs–which then create behavior–negative thoughts are dangerous things to leave unchecked. You must question them, challenge them. Says Who? shows us how. More than simple “think positive” slogans and inspirational platitudes, this is not just a motivational book; instead Says Who? provides practical, tangible steps to tackling a condition that affects us all: negative thoughts.